I'm still not feeling right today and I think two days of drinking re hydration salts and eating rich tea biscuits have sapped my energy somewhat. But I did manage to drag myself outside to do some watering. 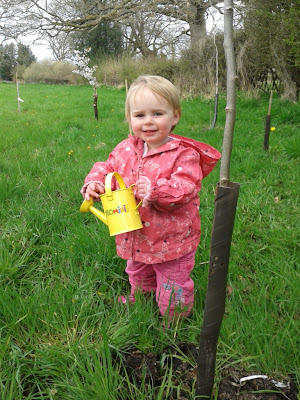 It's essential when you plant trees as late as I have this year to keep them well watered for the first few months and in any dry spells for the first year. 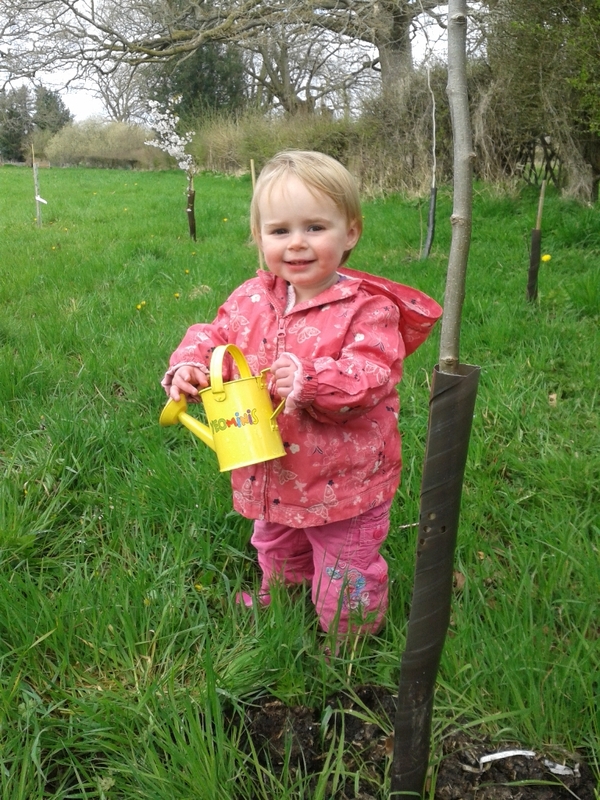 It has rained a bit over the last few days but not enough to soak the roots, so me and the little girl donned our wellies and went watering trees. Well she filled her watering can with soil but I'm sure it won't be long until she gets the idea! Watering cans make very stylish plant pots! Rehydration salts are good, but swallow Bactrim Forte and Metazol along with plenty of fluids. The doctors here say water but I tend to whisky. I have the squirts at the moment but they are only eye wateringly painful so I am just drinking lots of beer and keeping the toilet paper in the fridge. Força meo compradre. If I had a willing little helper like that, Don Kev, I also would drag myself over broken glass to be with her. 5 days of it in the end! Not a happy bottom I can tell you! I drink so little beer (and I can't stand whisky) that I'm sure that would make me a hundred times worse! As for my little helper she does make it all worth while. Mind you your little lad looks like he'll be handy to help daddy about the place! You are giving your daughter such wonderful experiences to remember life long! Tell me about it! This last year or so has just disapeared!